Nonprofit organizations are stepping in to fill the gap and serving increased numbers of children diagnosed with developmental disabilities and their families. The need in the community is great and the need across the U.S. is vast. Many of Cramer’s philanthropic partners are making an impact in this sector. From caring for children and adults with severe and profound developmental disabilities to caring for children with autism, non-profits are creating innovative ways to serve the increased number of children and adults diagnosed. 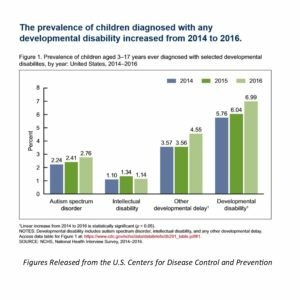 New figures from the U.S. Centers for Disease Control and Prevention show that more American children have developmental disabilities. Between 2014 and 2016, the prevalence of developmental disabilities among kids ages 3 to 17 increased from 5.76 percent to 6.99 percent. As the numbers of children diagnosed increases, organizations serving in this sector must address the increased need for employees by recruiting, hiring and training staff in all areas. Recently, on Good Day Columbus Fox 28, John Martin, the Director of Ohio Department of Developmental Disorders, shared that there are many job opportunities across the state. Individuals can have a great impact on someone else’s life by working in this sector and serving those with developmental and behavioral disorders. The Ohio Provider Resource Association along with the Ohio Department of Developmental Disorders created a workforce website, DSPOhio.org, to help eliminate the workforce crisis happening in this sector. The Director Support Professional Ohio (DSPOhio), a statewide recruitment effort connects potential employees with developmental disabilities provider employers. Cramer’s philanthropic partners are taking advantage of this recruitment tool to attract needed employees and are listed on this website. Nonprofits sharing about this need in the region, state and world opens the door for greater philanthropic support, advocacy and volunteer opportunities so that the organization can continue to have an enormous impact on those individuals with developmental disabilities and their families.